This year, Russian workers can ask their employers to pay for programs to improve health and fitness. Want to stay healthy and fit? Then ask your boss to pay for it. According to the Ministry of Labor, as of 2015, this will be an option for workers in Russia –giving a new impetus to that New Year’s resolution to get in shape. Valery Korzh, the director of the Department of Environment and Safety at the Ministry of Labor, told Russian daily Izvestia that an article of the worker-friendly Russian Labor Code that requires companies to spend 0.2 percent of their operational costs to improve working conditions could be used to improve employees’ health: "Employees can suggest to their employers to spend this money for fitness," Korzh said. In the past, the money has been used to improve workplace safety. 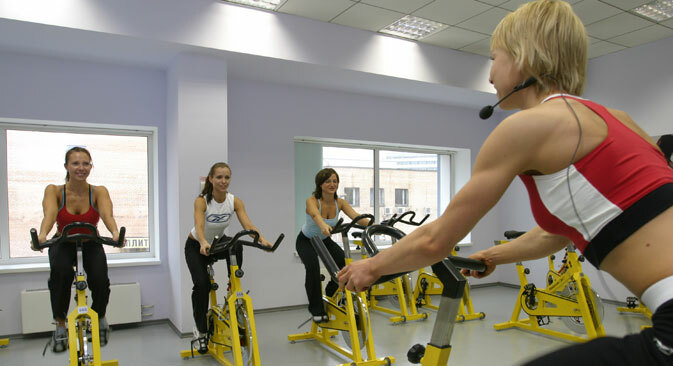 Korzh added that there are many options for businesses interested in helping their workers stay in shape. He suggested making special arrangements with local gyms, organizing workouts at their offices or renting nearby stadiums for training sessions. Duma Deputy Alexander Karelin, who is also a three-time Olympic golden medalist in Greco-Roman wrestling, welcomed Korzh’s idea, but said that it needs an "elegant approach": "We have to work it over not only with company managers, but with the company owners who also interested in having employees who are staying fit," Karelin said. To prove his point he paraphrased the famous Tsarist era reformer Peter Stolypin, who said that a government “wants to see its farmers rich and well-to-do.” "The government also wants to see its citizens healthier," Karelin said. Employers, however, have mixed feelings about the plan. "We have our own corporate fitness programs with discounts. People do understand that sport helps to ease stress and turn off brains even without any orders from the Labor Ministry," said Anna Amelkina, head of the press service at VTB24 bank. Andrei Zaitsev, the head of the Naumen company, which operates call centers in Russia and abroad was more straightforward in his criticism: "I am all for sport and I hope everyone is, but I am against any additional steps from employers. The company pays money, and it is up to the employee to decide how he wants to spend it," said Zaitsev, who added that being forced to cover such costs could force employers to cut wages. "At the same time, employees will see their free pass to fitness club not as a part of the salary but as a free bonus," he said. Back to the USSR or back to the banya? The physical education program was designed for Soviet educational, professional and sports organizations, and involved people ages 10–60. People who passed special G.T.O. fitness tests were awarded medals and pins they could wear. The program was abolished in 1991, with the end of the Soviet Union. In March, President Vladimir Putin signed a decree bringing back the program, with a few changes. The program will be available to children as young as six and tests for physical fitness will be voluntary. Swimming coach Olga Hilal believes that the Soviet Union was a better country than Russia in terms of public fitness, even though the word “fitness” didn't exist: "In the Soviet Union, there was a very useful approach toward national health: free sport facilities were opened for children while adults paid a minimum price for attending sports classes,” Hilal said. American writer Bryon McWilliams believes that Russians already have the best available technology to improve health by exerting the least amount of effort. McWilliams, author of the book "With Light Steam: A Personal Journey through the Russian Baths" thinks that the key to good health is the banya, and that investing in more public baths can be a cheap alternative to paying for fitness clubs.